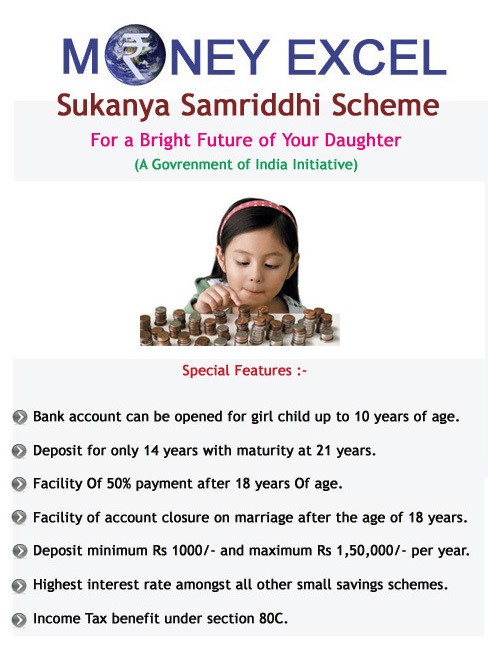 Sukanya Samriddhi Scheme – Government recently launched Sukanya Samriddhi Account – Saving scheme is for girl child. This scheme is specially designed for girl’s higher education or marriage needs. Let’s go through detail of Sukanya Samriddhi account. Sukanya Samriddhi account can be opened on girl child name by her biological parents of legal guardian. Maximum age limit for opening this account is 10 years. One year relaxation available this year. Minimum deposit amount for this account is 1000 Rs/- and maximum is 1,50,000 Rs/- per year. If minimum amount is not deposited, there will be fine of 50 Rs/- every year of default. Money can be deposited by cash or cheque. Maturity date is 21 years from date of opening or marriage date of girl child whichever is earlier. Interest rate of this account is 9.2% for FY 2015-16. One can withdraw 50% money for higher study of girl child after her age of 18 years. Account can be opened in post office or in Authorized bank branches. This account can be operated by parents of child till girl attains age of 10 years. On attaining age of ten years, the account holder that is the girl child may herself operate the account. This account can be closed in case of death of girl child. The pass book shall be presented to the post office or bank at the time of depositing money in the account and receiving payment of interest and also at the time of final closure of the account on maturity. Do you need Sukanya Samriddhi account? Sukanya Samriddhi account is very good initiative taken by government to increase saving for girl child. Many parents face cash problem at time of marriage of girl child, for them this type of scheme is boon. 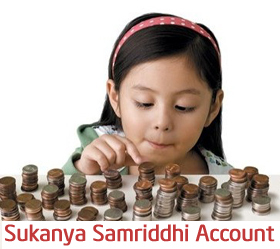 One can open Sukanya Samriddhi account and start depositing money every month systematically. Interest rate on this account is 9.2% which is more than fixed deposit. Sukanya Samriddhi Account will provide tax free return.This scheme is falling under EEE scheme means amount invested and returned earned is non taxable.Looking at tax benefit and return applicable you should invest in Sukanya Samrriddhi Account. Finance Ministry Notification for Sukanya Samriddhi Account can be downloaded here. 1. Kindly confirm maturity is taxable or TDS applicable on same. 2. Which section under rebate we claim. Maturity amount is not taxable. NO TDS is applicable. Tax deduction can be claimed for money deposited for Sukanya Samriddhi Account under 80C. Dear Sir, im not getting the form in bank or post office, even Allahadbad Bank and PNB bank dont know the Sukanya samriddhi account. could u pls let me know hw can i get the form??? RBI has released a general form in their website. You can check out the link below and download the form. Use that form to open SSA account in post office. If there is no tax benefit or exemption from clubbing with parents income then what is the fun of depositing in this account instead of Fixed Deposit. Then depositing in this account is only imposing unnecessary restrictions on yourself.